What do solar panels, bees and apples have in common? It turns out quite a bit. On a few acres west of St. Joseph, a solar farm, bees, a cidery and smart entrepreneurs are collaborating to protect the environment and distill a tasty drink. This month, Milk & Honey Ciders introduced Solar Sweet Farm Cider, a cider blended with honey from the hives on the solar farm next to their orchard. Adam Theis, Milk & Honey’s co-founder and cider maker, said the cidery produced about 140 gallons of the special drink. It was released at the cidery on Oct. 6 and it’s also available in restauranteur Kim Bartmann’s Twin Cities establishments, including Tiny Diner, Bryant-Lake Bowl and Pat’s Tap. The collaboration starts with the 19,000 solar panels on 60 acres between Milk & Honey and Interstate Highway 94. IPS Solar of Roseville runs the solar operation that produces enough energy to power about 1,000 average homes. The hives belong to Bare Honey of Minneapolis. Pulling all the players together was the work of Fresh Energy of St. Paul. Rob Davis, director of the organization’s Center for Pollinators in Energy, said that everyone involved had shared values to make productive use of land around the panels by planting native plants that also help hold the soil around the panels. In addition to producing honey for the special cider, the bees pollinate the apple trees in the orchard. Milk & Honey has about 600 trees on the site and they have plans to add 3,000 more, Theis said. This is Milk & Honey’s sixth harvest. The cidery started with 2,000 trees on a two-acre site near Cold Spring before moving to rural St. Joseph last year. The cidery ferments apples from the harvest once a year and produces about seven different ciders. Fresh Energy aims to shape and drive a realistic and visionary energy policy that benefits all. They’ve been working on energy policy for more than 25 years. The major subscribers to the IPS solar project are the St. Cloud, Annandale and Paynesville school districts. 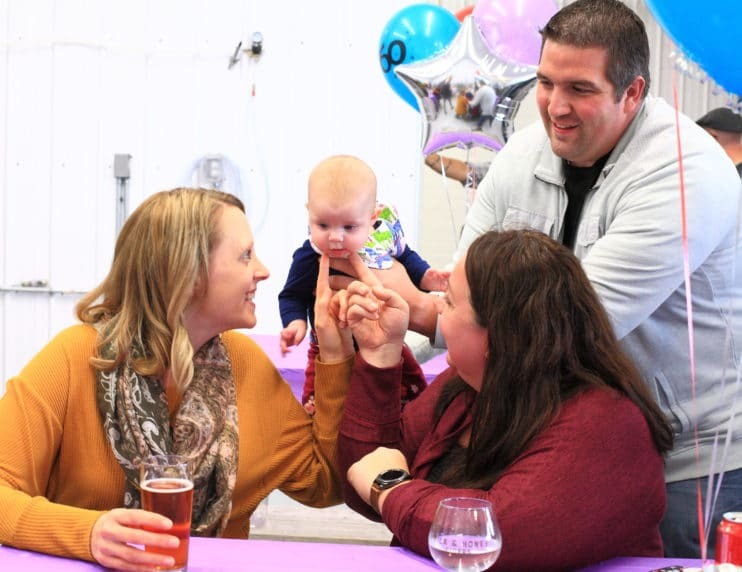 Jessica Timmer of Sartell and Joe Westerlind of Clear Lake challenge their spouses, Chris Timmer and Susie Westerlind, to a game of Sequence while enjoying beverages Oct. 6 at Milk & Honey Ciders. 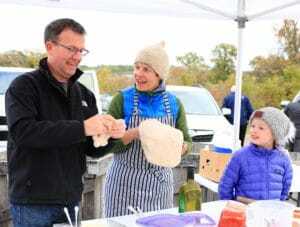 Derik Weldon, Kate Ritger, and Cecelia Weldon, 10, all of St. Joseph, stretch dough for honey drizzled pizza Oct. 6 at Milk & Honey Ciders. Ritger owns Just Food Collective, a St. Joseph food-truck business.